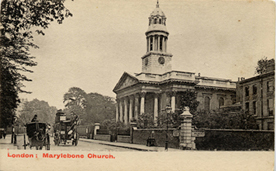 Marylebone Road showing Marylebone church where Collins was christened. Harley Place was about 400 yards along on the right. Collins moved to 2 Harley Place with his mother and brother in June 1856. It was situated on New Road which was renamed the following year. The address then became 11 Harley Place, Marylebone Road where he lived until 1858. At the pleasant dinner of Tuesday Dickens told me that you were desirous of knowing my brother's address. It is "17 Hanover Terrace" in the Regent's Park - until the 24th of this month. After that period we move into a new house - No 2 Harley Place, Upper Harley Street , New Road - where my brother will have his studio. Whilst in Harley Place Collins wrote The Dead Secret and The Frozen Deep. 11 Marylebone Road instead of Harley Place.